In 2014, fines for violations of the rules of conduct at the stadiums will grow manifold, and blatant violators among the fans will be banned to attend the matches for some period of time. The most notorious fans will be put on the blacklists and will be stripped of the right to go the stadiums for their lifetime. On Thursday, the Russian governmental daily Rossiiskaya Gazeta published the law on fans, which stirred up high passions in the football world and the whole football community. The law will take effect in 180 days, and, according to the idea of its initiators, should put an end to all outrages at the stadiums. Anyway, football officials welcomed it ardently, through the response of the fans was naturally much less excited. The idea of this law has been discussed already for several years, as the violations by the fans did not stop. But two scandals, which broke out in Russian football in the autumn of 2012, broke the camel’s back of the state authorities and sport functionaries. On September 26, 2012, a 1/16 stage playoff game of the Russian Cup between Torpedo Moscow and Dynamo Moscow was interrupted due to the misconduct of the fans, which were hurling many flares on the pitch, the incident recurred at a match between Dynamo Moscow and Zenit St. Petersburg in a more outrageous way on November 17. A player was diagnosed with “the burns of cornea, eyelids, and conjunctivas of both eyes, as well as posttraumatic otitis of the right ear with a falling hearing capacity” The match was stopped and a forfeit defeat was handed down on Zenit. After this incident Prime Minister Dmitry Medvedev urged the lawmakers to finalize the legislation over security at the stadiums, imposing tougher requirements on the fans. Under the new law the fans, who violated the rules of conduct at the competitions for the first time, will be fined up to 10,000 roubles and sentenced to up to 160 hours of correctional works. Meanwhile, they can be banned to attend the matches for a period of time from six months to three years. In case of a repeated violation and the misconduct that resulted in the disruption or suspension of a match, the fine will reach 15,000 roubles, and a fan can be put under administrative arrest for 15 days. The sanctions can also be much tougher: a ban for the right to attend the sport competitions can be from six months to seven years. The court will take a decision in this case. Particularly vicious fans will be put on the blacklist and they will be forbidden to attend the stadiums at all. The Interior Ministry will be keeping the blacklist, the Ministry of Sports should produce the information about such violators to the police. An absolutely new position of steward is introduced. The stewards will be fully in charge of ensuring order at the stadiums at matches. The policemen do it now. The fines are envisioned not only for the fans, but also the organizers of competitions and the owners of the sport arenas. For instance, officials will be fined up to 100,000 roubles for the failure to ensure security at the sport facilities and other violations, legal entities will be fined up to 300,000 roubles with possible suspension of activity for 90 days. The football leagues will define the visiting rules at the stadiums. 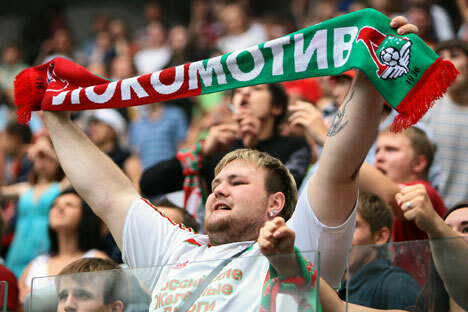 In particular, the Russian Football Premier League stated back in the previous year about the introduction of a new rule that the tickets for matches should be made personalized and the fans can be admitted to the stadium with the passport produced. The document evoked an ambiguous response in the Russian society. In particular, representatives of the fan firms stated that the law is groundlessly harsh, setting a total control over the fans. The officials did not agree with this position. “There will be no tougher measures regarding decent fans in terms of total control and repressive measures,” the Rossiiskaya Gazeta daily quoted President of the Russian Football Premier League Sergei Pryadkin as saying. “Now the fans will be legal subjects of our sport,” the news agency R-Sport quoted Minister of Sport Vitaly Mutko as saying. “A serious conceptual framework of the law was provided, then two bylaws should be adopted, the responsibility of the organizers of competitions, the responsibility of sport clubs, the powers of stewards, the rules of conduct, the rules and measures of the law enforcement agencies should be determined. In general, a serious work is going on, no one does anything against the fans,” Mutko said. Head for security of the Russian Football Premier League Alexander Meitin also believes that the law was needed. “The enactment of the law on fans was dictated by the very life. At least, thanks to it the responsibility of both parties, namely the spectators and those who are in charge of their security at a match, was defined. The police will ensure the order on the territory next to the stadium. The stewards will be supervising the conduct of the fans,” Meitin said. President of the all-Russia union of fans Alexander Shprygin acknowledged that the law “could have been harsher towards the fans, and now it is well-balanced. “All people were concerned over the rule in the law to sell the tickets with the passports provided. This cannot be done, if there is another document, which identifies a person. The fines are a correct decision. A fine in the range between 3,000 and 10,000 roubles will stop people,” the RBC-sport digital edition quoted him as saying.